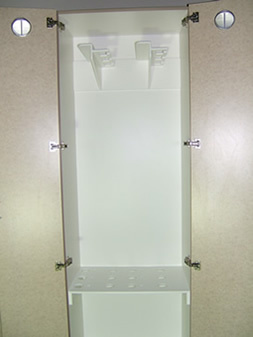 Our endoscopy storage cabinets have exclusive features that are built to last. 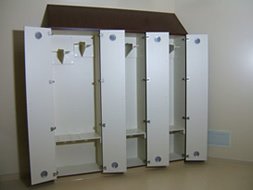 The interior and exterior are fully covered with plastic laminate, and the floors are silicone sealed. 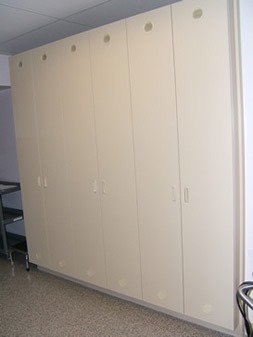 These finishes provide non-porous surfaces which allow sterile environment control to be an effortless top priority. 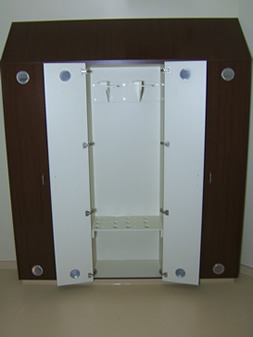 The hinged doors are fitted with 170 degree Blum brand limited lifetime warranty hinges, 4 inch rounded louvered vent grills, and any handle, knob or pull that is readily available which can be fitted with optional locks. The scope support brackets are fully supportive and made with half inch thick pure acrylic non-porous material that meets ASTM G-21 and G-22 standards for fungal and bacterial resistance. All edges are radiused to prevent damage to the scopes. The lower snap clips are stainless steel with stainless steel hardware. The upper bracket has an offset throat allowing the head assembly to be slid in the back, preventing accidental dislodging and subsequent damage. The endoscopy side cable exiting the head assembly is supported by the top left shelf, minimizing stress as the cable extends to the lower support shelf. 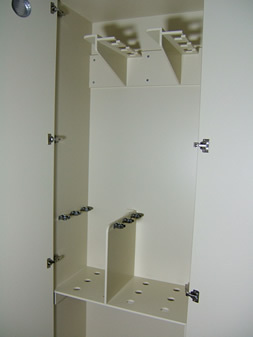 The matching lower support shelf meets the same specs and is placed at a height to support the weight of the machine connection eliminating the stress on the cable. The lower shelf is also drilled to allow the passage and vertical routing of the camera cable. The lower shelf is installed at a height to hold the camera cable above the floor line. Fujinon scopes require additional stainless steel spring clips to support the small cable fitting and an additional center vertical panel for clip mounting. We can build to match specified plastic laminate finishes and we can provide installation or detailed installation instructions.